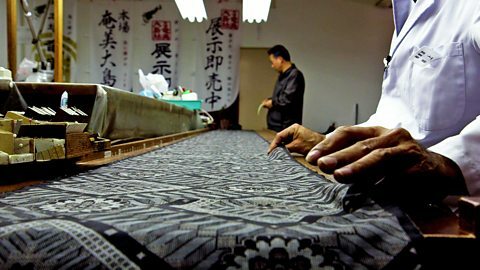 The production of a kimono on the island of Amami Oshima is so meticulous that a single mistake could squander the efforts of every artisan in the process. Handmade in Japan tracked the year-long transformation of the island's famous mud-dyed silk into an exquisite garment. 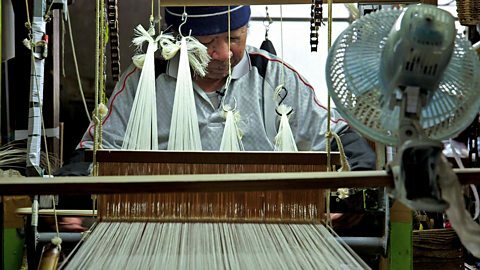 The small Japanese island of Amami Oshima is famous for producing a type of silk: Oshima Tsumugi. More than 500 people on the island are involved in producing this unique fabric, which is known for its subtle colours. Much of the Oshima Tsumugi is made into kimonos – Japan’s national dress. Each kimono takes over a year to make, and costs around £5,000. The complex and time-consuming process involves a different expert at each stage. The shape of the kimono hasn't changed since its first appearance around the 15th and 16th centuries. What used to be the undergarment became outerwear, which was simply wrapped around a person. Different dyes and embroidery have always been used to add creative flair and variety to the kimono. 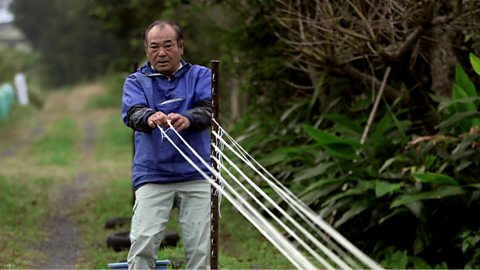 Toshihiro Yamaguchi stretches out his seaweed glue starched silk to dry outside. The length of silk is decided according to the type of pattern, and then all of the threads are bundled. Then noridzuke, or starching, takes place. Seaweed powder is boiled with water to make the starch paste, which is used cold. The starched silk is strung out to dry in the sun. Any little mistake here would transfer it on to the next pattern. The starcher can walk several kilometres a day laying out the silk bundles. Oshima Tsumugi silk, which is said to be 1,300 years old, is famous for its intricate patterns, which now come in a huge variety. Early designs were often based on nature - in particular, trees and plants that held a special place in the hearts of the islanders. Makoto Injun carefully arranges the undyed silk on his loom into the final pattern. The binder makes a pattern which matches the the design pattern. The part that is bound will remain white when put through the mud dyeing process, and the open sections will be dyed black by the mud. Even one small bit of dye in the bound section would turn it black where it’s supposed to be white. Yukihito Kanai's company was started by his father, and has been active for almost 40 years. The red dye that they use is hand-produced from the Yeddo Hawthorn tree, which is indigenous to Amami, and takes a week to prepare. The cloth is dipped into the tannin 20 times. 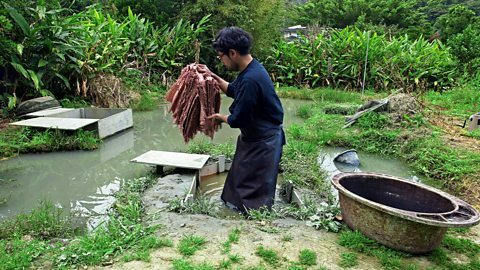 The red-dyed cloth is then taken to a pond where it is mixed with mud that is rich in iron. This chemically reacts with the bark dye and darkens the fabric. 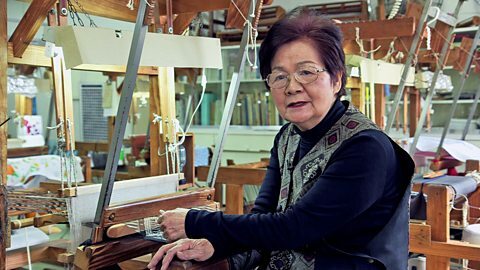 Mifuko Iwasaki on the importance of weaving and how this determines the kimono's look. It takes around a year for the silk to reach the weaver. Some 12.3 metres of cloth are used to make just one kimono. This stage is vital for the quality of the silk. Mifuko Iwasaki says: "Calmness is important. "If you’re not in a peaceful state of mind it will show in your work." Amami Oshima is famous for its folks songs. Some are about its weavers. Isosuke Inoue's job is to check the finished silk meets the correct standard of weaving. Much of the inspector's work is done by feel, rather than by sight. If it passes, the cloth is stamped and stickered before being sent to a tailor for the final stage in its journey to becoming a Oshima Tsumugi kimono. This final process is called erikuke. As the cloth is handwoven the silk can slide and slip out of place, so it needs to be subtly adjusted. Mika Tahara says: "I take great care, making sure over and over that I’m cutting into the right part." A family of Samurai sword makers continue an ancient tradition. Watch on BBC iPlayer. Follow the elaborate production of a Japanese kimono on the island of Amami Oshima. This film follows Tomoo Hamada as he creates traditional pottery in a wood-fuelled kiln. Watch a preview of the new series from art historian, Dr James Fox. 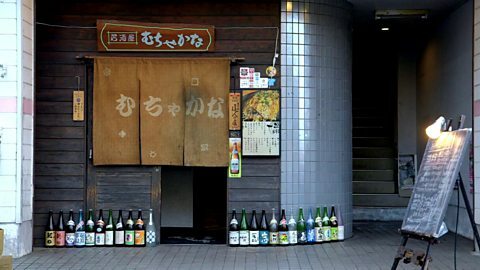 A series of three idents specially created for the Japan Season, starting 12 June 2017. Find out everything you need to know about the three weeks of programming on the art and culture of Japan.